Standards are published documents setting out the specifications and procedures designed to ensure products, services and systems are safe, reliable and consistently perform the way they were intended to. In July this year, a global standards committee with the not so catchy title of ISO TC 94 SC 14 (Firefighters’ Personal Equipment) will convene in Australia. The impetus for the creation of standards committees came about because of concerns over the quality of some performance products entering the global firefighting market which, over the years, had been linked to certain fatalities. The King’s Cross fire at the King’s Cross underground station in London in 1987, which cost the lives of 31 people including one firefighter, was one of the most significant milestones on the road towards the advancement and better standardisation of firefighter PPE. With the publication of the EU Directive on PPE in 1989, the PPE market in the EU was opened and harmonised and gave rise to the creation of European Standards. 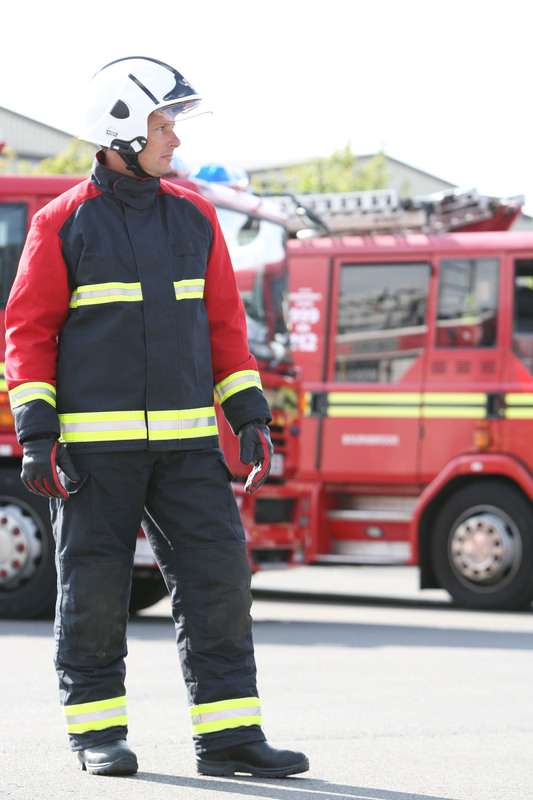 This led to the introduction of European Standard EN 469 (Protective Clothing for Firefighters) that enshrined in law the need for garments to undergo a number of tests to ensure they provided adequate protection against both radiant and convective heat. In addition, they must also meet the requirements for resistance against water penetration and tearing. Increasing focus on the issue of heat stress – considered to be the biggest threat to the safety of firefighters – resulted in the introduction of various standards in recent years. These include the incorporation of water vapour resistance testing into EN469:2005, the introduction of a physiological Annex F into the latest revision of EN469 and the development of the sweating articulated manikin test method ISO 15831:2004. Heat stress can not only imperil the life of a firefighter but, on a more day to day basis, can seriously harm someone’s decision-making ability which, in turn, potentially puts the lives of colleagues on the line. The body’s internal core temperature is closely regulated and remains within a very tightly defined range from approximately 36°C to 38°C. This temperature range is maintained by controlling the equilibrium between the amount of heat the body produces through physical activity, the amount of heat stored by the body and the amount of heat lost to the surroundings through sweat evaporation and heat radiation, convection and conduction aided by vasodilation. When the ambient temperature of the surroundings rises to above 35°C, heat loss through radiation, convection and conduction stops and the only way left for the body to cool itself is through sweat evaporation. This will also stop if the heat and humidity becomes excessive, causing the body to store the excess heat generated and produce a rise in the core body temperature. The manufacturer’s role is to find the right balance between maximum protection as well as durability, comfort and breathability. The standards that are set by the various committees around the world should be seen as the minimum performance requirement and there is an expectation that companies operating in the PPE sector will strive to manufacture and innovate above this level. The work of the committees can be fascinating and, due to the nature of modern technologies, fast changing. It is manufacturers’ responsibility to ensure that the products available in the market do what they say they do, and that they are as sure as they can be that every time a firefighter puts on his or her kit it will perform to the required standard. It is not unusual to hear from firefighters that they do not really understand how the standards process works both in the UK and around the world. Something Hainsworth believes in passionately is the need to provide end users with as much information as possible to help them understand the structure and, ultimately, the capabilities of their kit. The modern PPE is so far removed from the woollen tunics that were still being worn by firefighters tackling the blaze at King’s Cross more than 25 years ago. The kit is more integrated and intelligent than it has ever been, which means that firefighters are afforded the best possible protection. Because the levels of protection are so sophisticated it increases the importance of firefighters understanding what their kit will not allow them to do. It is the role of standards committees to review published standards every five years to ensure that they remain totally relevant to the operational needs of firefighters in different parts of the world, whether they are structural or wildland. As the international standards organisation, ISO is seeking to create global standards, while the National Fire Protection Association (NFPA), BSI, CEN and AS/NZS are focussed on ensuring that their standards totally meet the requirements of firefighters in their regions. The same is the case for other countries in the world, such as Japan and China, which have their own standards committees. You will also see countries adopting standards from other parts of the world, for example it is not uncommon for a country such as Brazil to adopt NFPA standards or for China to specify a CEN standard. The meeting of ISO TC 94 SC 14 in Sydney at the end of July will bring together more than a dozen countries and will be an opportunity to share knowledge from different parts of the world and ensure that the ISO standards for firefighters’ personal equipment meet the needs of today’s firefighter. Among the issues that have been evaluated in the past year is whether manikin testing of firefighter PPE should be adopted into the standard. The way in which standards are created, implemented and reviewed works as well as they can ever work when you have to take into account the views of different countries, many of which operate in very different firefighting environments. The committees on which Hainsworth is fortunate to sit are working to ensure a level playing field for those whose job it is to develop modern firefighting PPE, while at the same time locking in genuine quality controls through published standards. The consequences of not complying with PPE standards laid down by many of the world’s standards committees are severe with the threat of prosecution a very real threat. When the ISO TC 94 SC 14 committee convenes in July, each member will be in no doubt about the responsibilities that have been entrusted to them. Central to every discussion that takes place and decision made will be the need to ensure that firefighters across the globe are wearing PPE kit that will enable them to return home safely to their loved ones at the end of every day. Simon Burnett-Boothroyd will be among those taking part at the ISO TC 94 SC 14 in Sydney. In addition to this particular ISO committee, he also sits on PPE firefighter clothing committees for BSI and CEN. Hainsworth was invited to join each of the committees and the company was actually involved in the origination of some of the standards committees. In Simon’s job he meets regularly with firefighters in the UK and abroad.